Limits muzzle flash for effective use in all light conditions. Seems nice... didn't come with a crush washer and of course i don't want to hassle just for a washer but would have been convenient to have it. Thanks for sharing your feedback, Frank. We're so glad you're satisfied with your purchase. Cheers! Just what I needed. Fast delivery. Only part I forgot for my build. Thanks guys. Thanks for sharing your feedback, Cody. We're glad you're satisfied with your purchase. Works as advertised. Very pleased with my whole order. Thanks for sharing your feedback, Matthew. We're glad you're satisfied with your purchase. Cheers! 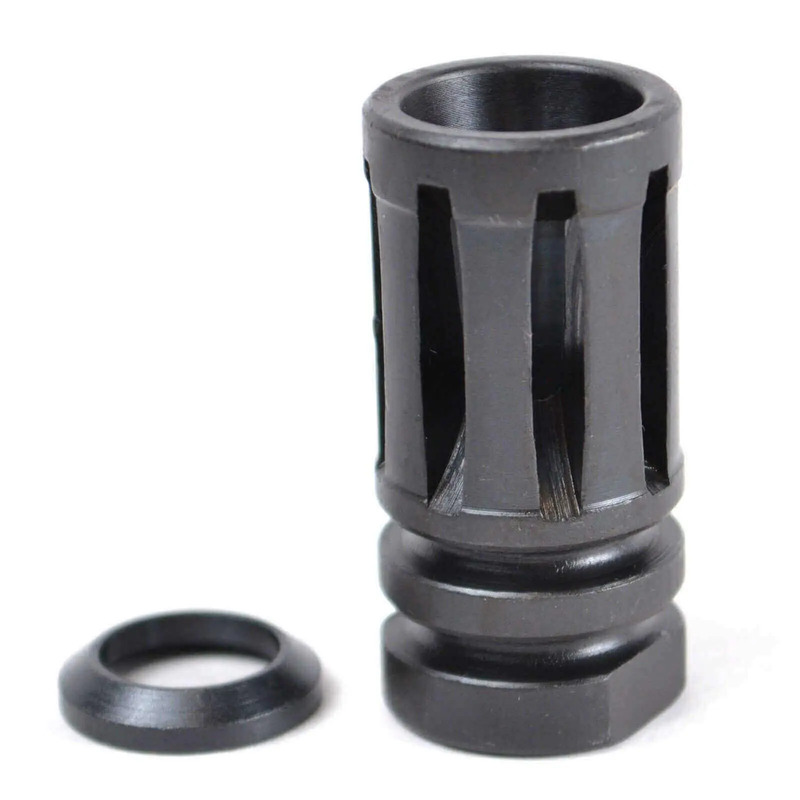 I bought this mil spec flash hider to replace the compensator on my AR-15 for AZ state rifle matches. The compensator creates a lot of dust and vented gasses that bother adjacent shooters. The flash hider works very well. Fast delivery. Thanks for sharing your feedback! We're glad you're satisfied with your purchase. Cheers! Very easy to install. I watched a quick YouTube video to determine which way the crush washer orients because I can never seem to remember. After that, it was easy-peasy. I would recommend an armorer's wrench, but this could easily be done with an adjustable conventional wrench. Fast shipping, too. These guys are great to deal with. Numerous products ordered, and no problems whatsoever. Their customer service is quick to respond and start a dialogue, answering my questions and helping me get the right parts for what I need. They even advised me when they were coming out with new products, suggesting I may want to wait a month. Exceptional.